As a responsible AdWords Client Manager, I had developed a process to check my clients account very regularly, as often as every day. This is so that I can make sure all AdWords accounts under my watch are performing to the level I want it to perform, making sure that none of them are running wild because of a change I made days prior. As I grow my clients and my team, it becomes impossible to log into the accounts and look at the different performance metrics I want to monitor. I keep an eye on daily, weekly and monthly trends to help me plan out optimization approaches throughout a week or throughout a month. At the same time, many of my clients would ask for performance update and rerunning a report for the purpose of providing a client a quick view of their account becomes a maintenance nightmare. As with any business owner, we always want to work on our business so that we optimize our process and we don't spend time doing the things that don't provide a lot of value to our business. And spending time creating reports just aren't the best use of my time nor my team members time. But don't get me wrong analyzing what's in the reports is definitely important to help client accounts perform better over time and the result is helping them become more successful in their business. So I would rather spend my time analyzing rather than creating the reports. As I grow and manage more and more accounts(up to 40+ accounts) this question emerge. How can I look at all the accounts quickly and see all the high level account performance in one place? Account performance like the clicks, cost, impressions, conversions, ctr, average cost per click and so on. And as I said broken down into different periods so that I can do a quick and dirty comparison of the trends. This way I can see them immediately and if something is off, maybe clicks are low or average cpc went up, I can go into the account, analyze what's going on and make necessary changes before the account goes south. That is the main challenge! Alright then, so we went to work. 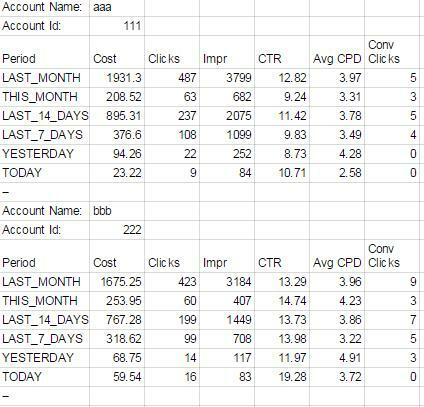 We have since developed several AdWords scripts to help us extract account performance on to a google spreadsheet to help us look at all the accounts we manage from different angles. However, this script that I'm about to share with you was the one of our simpler AdWords script that provided us with enough details to tell us that an account has a problem or needs more attention. This AdWords script extracts key information from each account and exports it to a Google Spreadsheet. Here's a sample output of the script. As you can see it shows me some key metrics per account and breaks down the data in different periods or time frame to allow us to see any undesirable trends. I typically look at the CTR and Avg CPC to see if prices are up and CTR is down etc. It just depends on how you conduct your optimization, it's a topic not covered here in this post. First, you basically associate all the accounts you want included in the report to a label. And then depending on how often you want to see the report, you'll need to schedule it, I do it twice a day, once in the morning, once in the evening and sometimes I'll just run the script to see what's going on. It's also very easy to provide a quick high level report to my clients if they ask for an update outside of the regular reporting we send them. Basically, I'll just copy the rows and columns of their account and paste it on gmail and send it to them. The report shows you all the key information what a typical not-very savvy client would like to see. To try this AdWords Script for Free please subscribe to our newsletter using the button below. I will add you to our newsletter and after you confirm your subscription I'll send you the instruction on how to download this MCC AdWords script for free. Or if you don't want to join our newsletter you can purchase this MCC AdWords script here. btw, if the default metrics(clicks, cost,etc) and period(today, yesterday, etc) are not enough for you and you want an expanded script, please check the the expanded version of this script, that allows you to configure metrics and periods you'd like to include. 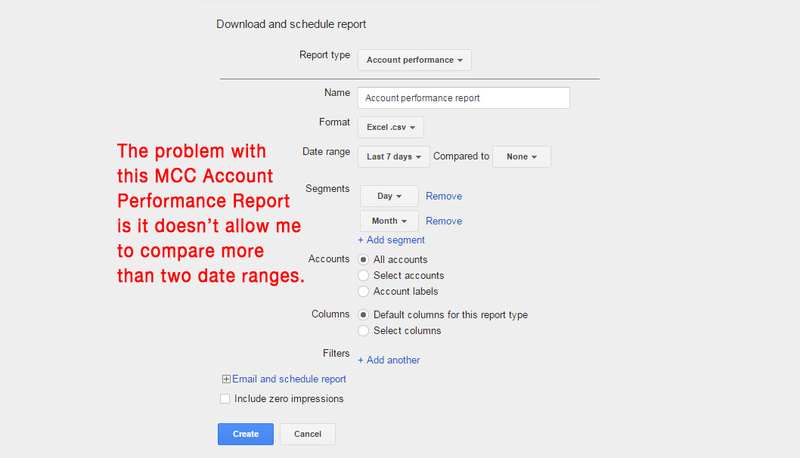 Check out the Configurable MCC Account Performance Snapshot AdWords Script. Note: Subscribe to our newsletter and you'll get the adwords script for free. Instructions on how to install and use the script is included. You'll also get updates on new scripts as well as adwords script giveaways. Already an Email Subscriber? Go directly to the AdWords Script page to download this script.